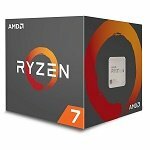 AMD Ryzen 7 1700 vs Intel i7-7700k CPU - Best Gaming Processor Around $300? AMD Ryzen 7 1700 vs Intel i7-7700k CPU – Best Gaming Processor Around $300? Today we’re testing the newly released Ryzen 7 1700 CPU up against its closest competitor from Intel, the i7 7700K. AMD has placed the 1700 processor at a very competitive price point at $329, directly competing with the $340 i7 7700K. 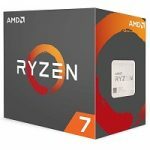 The AMD R7 1700 is the lowest price SKU in the Ryzen 7 stack, behind the 1700X and 1800X, but sports the same 8 Cores & 16 threads as its bigger brothers. The only difference, other than the price, is the out of the box clock speed of 3GHz and a lower TDP of 65W. This means we should expect it to run a fair bit cooler than the 95W TDP SKUs from AMD. From my tests, this is definitely true as the R7 1700 idles at just under 30C on a Noctua air cooler with two fans in a push-pull configuration. That’s with an overclock of 3.9GHZ at 1.3v. After running Aida64 for just over an hour the max temp that I saw was 57C. That’s roughly 20 degrees cooler than my 1800X that I tested recently at the same exact clock speed. 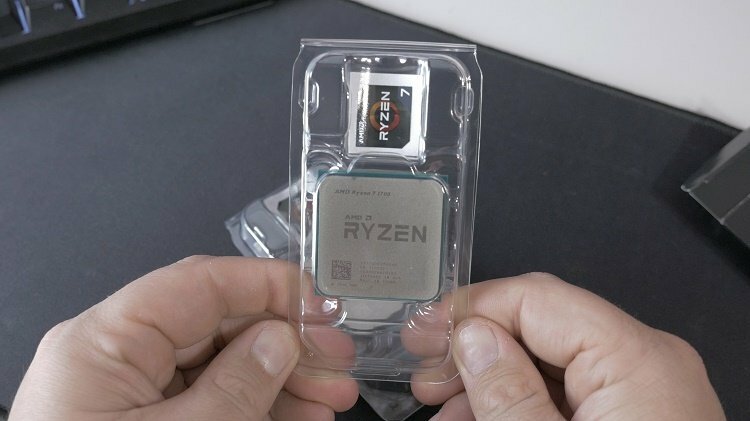 The 1800X however required 1.35v in order to maintain the 3.9GHz clock speed and when testing the 1700 and 1800X at the same speed they returned nearly identical performance. Before we get into our i7-7700k vs R7 1700 comparison, there’s one chart I simply had to share. Here’s how the R7 1700 stacks up against the R7 1800X in average FPS across 10 modern titles. I think what this shows is that clock for clock the Ryzen 7 CPUs are the same. What you’re essentially paying for is a higher guaranteed speed out of the box. For our testing, I had both the Intel i7 7700K and the R7 1700 overclocked to the highest stable point I could get. As previously mentioned, the R7 1700 is running at 3.9GHz and 1.3v while the i7-7700K is at 5GHz with 1.365v. Both systems utilized 16GB of DDR4 memory clocked at 3000Mhz, however one was Corsair Vengeance and the other was a G.Skill TridentZ kit. Both motherboards were Gigabyte boards. For AMD we had the AM4 X370 Gaming 5 and for Intel, we used the Z270 K7 board that I recently used in my Frame Raider Quiet PC build. For the graphics card, we’re using the GTX 1080 overclocked 200Mhz on the core and 300MHz on the memory and all of our games were tested with the Ultra preset at 1080p & 1440p. Here’s a $1,000 AMD Ryzen 7 1700 Editing build as well as our B350 motherboard rundown for those looking for more information. Starting off we get a look at the averages at 1080p and then we will move into the minimums as well as 1440p testing. I’ll be honest that I was rather surprised with just how well the Ryzen CPU was able to keep up with the 5GHz 7700K. We can see here that while Intel did take the majority of the titles tested, most of them were only by a few FPS. Games like The Division, Rainbow Six Siege and Battlefield 1 leveraged the additional cores of the Ryzen R7 1700 showing the potential of having an 8-core CPU for games that are optimized to take advantage of them. I think this is going to be a very important proving ground as we move forward with more developers working on multithreaded utilization. Those results we saw continue over into the minimums where the 1700 and 7700K are neck in neck in the majority of games. GTA V and Rise of the Tomb Raider are exceptions where the Intel i7-7700k seems to pick up a larger margin of victory. That being said, we see the R7 1700 winning in The Division & Battlefield 1. I did also want to include 1440p testing for people that were curious about the performance they could see with a Ryzen CPU at higher resolutions, but nothing changes here with our results against Intel because we are depending solely on the pixel throughput of our GTX 1080 to handle having more pixels on screen so we don’t get to see any big surprises here. 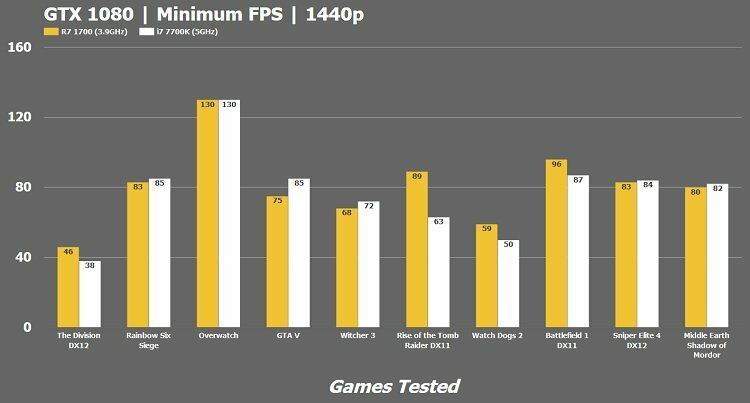 Once again AMD wins out in The Division, Rainbow Six and Battlefield 1, but falls behind on other games tested. Lastly here are the minimums for 1440p up on your screen although there isn’t really much to say about these because we’re really just seeing the same exact story as 1080p, only with fewer frames per second. I will touch on Overwatch for those of you that are curious as to why its basically the same or within one frame of the average. 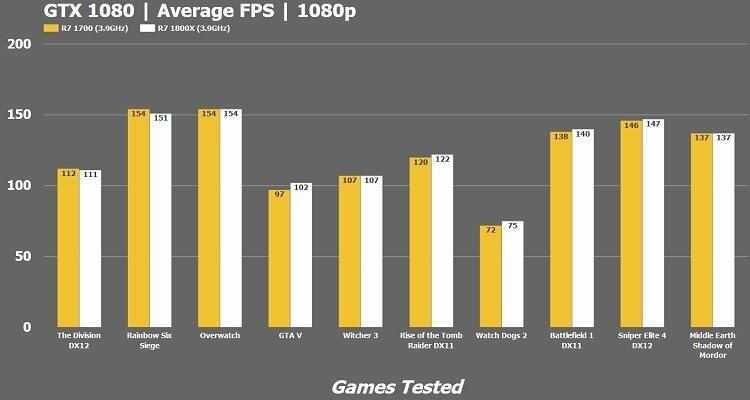 That’s because Overwatch has a CPU bottleneck where it only utilizes 2 cores at any one time so this prevented our GTX 1080 from seeing its full potential. So, at the end of all of this, would I recommend a R7 1700 over the Intel i7 7700K? Yes, I would, depending on what you expect to get out of it. 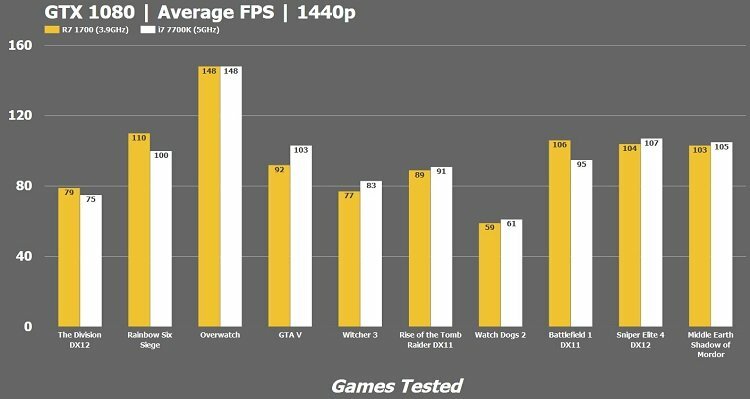 I think the performance we are seeing here is close enough, that the benefits of having the 8-cores/16-threads for the future are going to be extremely useful for gamers in the long run. That being said, it really comes down to what games you play. If Battlefield 1 is your bread and butter and you want the most FPS possible, then it will benefit greatly from Ryzen. Another fanastic performance improvement for Ryzen is fast memory. 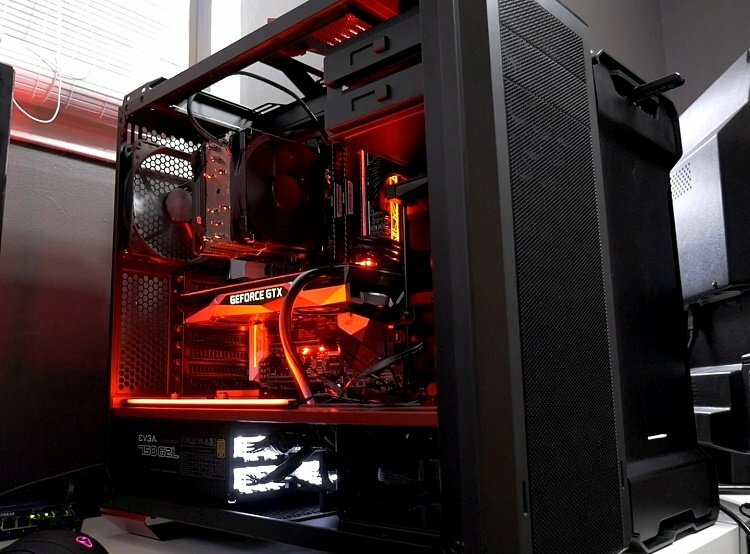 Take a look at some of our best kits for AMD Ryzen here. Also, another thing to consider is content creation. Having those additional cores and threads can add up to nearly 50% faster performance for highly intensive multithreaded workloads like video editing or game streaming. I do plan to do a follow-up post on this shortly after launch day where I’ll be testing game performance during a live stream to see how much our performance is impacted between these processors. Want more benchmarks on the Ryzen lineup? Here’s how the Ryzen 5 1600x stack up against Intel’s i5 CPU. Also, take a look at our Ryzen 5 1600x PC Build. One thing is for sure, AMD Ryzen is here in a very big way and it seems to have delivered on the promises its made in the months leading up to release. AMD had a plan to come in and crush the competition with Intel and I think they’re managing to get right in there to be truly competitive again. This is something that will only benefit us consumers as it will force Intel to innovate sooner and even drop its prices, which has already begun to happen. If you enjoyed this information, you can help me out by leaving your feedback and comments below. Also, if you’re planning on purchasing the AMD Ryzen 1700, use the links in this post to give me a small kickback. Something isn’t right here. I have a STOCK 7700k with a gtx 1080 and my Siege FPS never dropped below 136 and usually averages around 155 – 160 on Ultra settings on 1080p. I always run multiple applications in the background as well. I have reviewed at least 10 of my shadowplay videos checking the FPS counter at the top. If your 7700k is truly overclocked, why would it be losing to my stock 7700k? And how much more expensive will it be? I understand that the main hype/market for the ryzen is games, but any chance anyone knows about more abstract comparatives. I can’t find them anywhere, they used to be the main source of data in the past. Please, consider running it, I am desperate to know how Ryzen and Kaby Lake perform with all modern fast compressors. I will be very glad to publish results into tables – many coders/users would appreciate such a showdown. 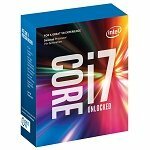 The 1700 is cheaper than the 7700k. The 1700 also has 8 cores and 16 threads vs intel’s 4 core 8 thread. So it’s a much better processor going forward. It is well known that having less threads results in better single core performance. The 7700k 8 thread processor is probably the sweet spot for gaming right now. remember Ryzen is going to be releasing 6 core and 4 core 12/8 thread variants soon which will be a better test vs. the 7700k as the single core performance will be better. Same reason the i5 used to beat the i7 in gaming, even though the i7 was clearly a better processor and more future-proof. The 16/12 thread processors will be better for runnign background tasks and streaming vs the intel variant price. Remember the 6900k costs $1,000 and the 1700x costs $450 or so, and the 1700x is better. What is this Windows 10 Performance Mode I keep hearing about? 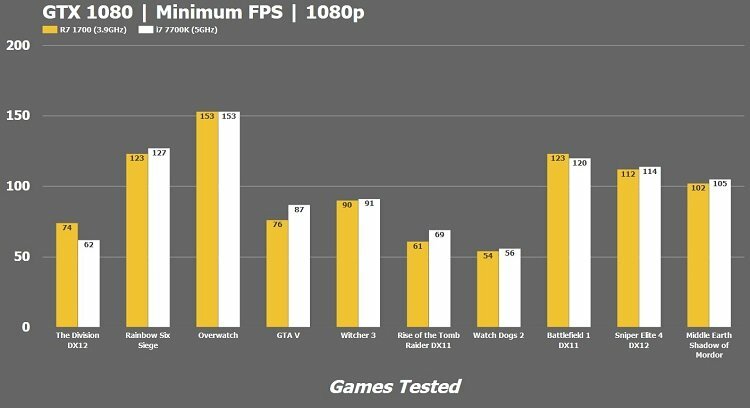 Can you post a overwatch benchmark without frame caps please? Thanks for the useful and fair info dude! Greetings from Chile! Any quick or detailed thoughts on how the stock 1700 cooler performs? Most people are saying you can reach 3.7-3.9 all cores on the stock cooler. The r1700 does not come with a cooler I’m pretty sure, you have to buy a third party. Which ram in which board? What video settings did you use in your benchmarks? Thanks for doing this, I have been looking for R7 1700 overclock reviews!